No On/Off Switch - Energy savings mode starts after 26 hours. 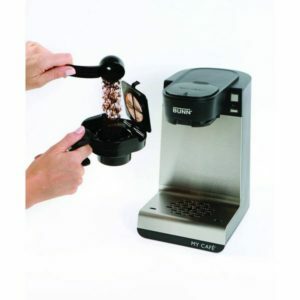 With the Bunn Single Cup Coffee Maker, you are completely flexible and prepared for all of your desires. It lets you brew K-Cups, coffee or tea pods, tea bags, tea and coffee grounds and can also provide you with a simple cup of hot water for your oatmeal in the morning. 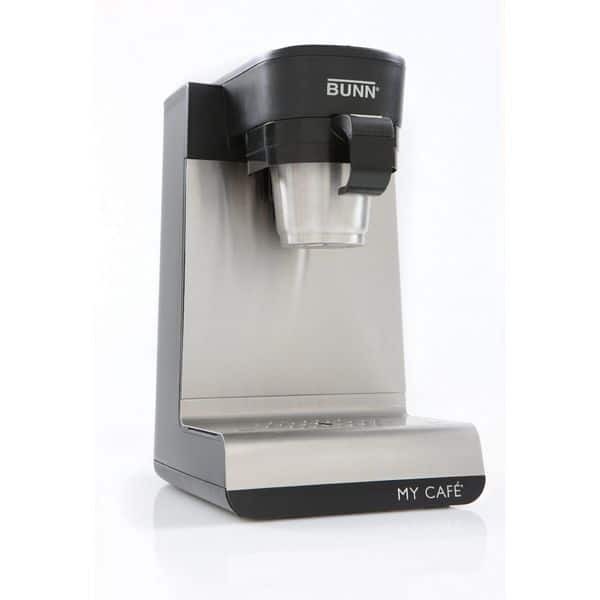 If you don’t want to limit yourself in with a ‘K-Cup only’ single cup coffee maker, the Bunn My Cafe MCU is a very good option for your kitchen counter. So let’s see if the next Bunn Coffee Maker has your address label on its carton. 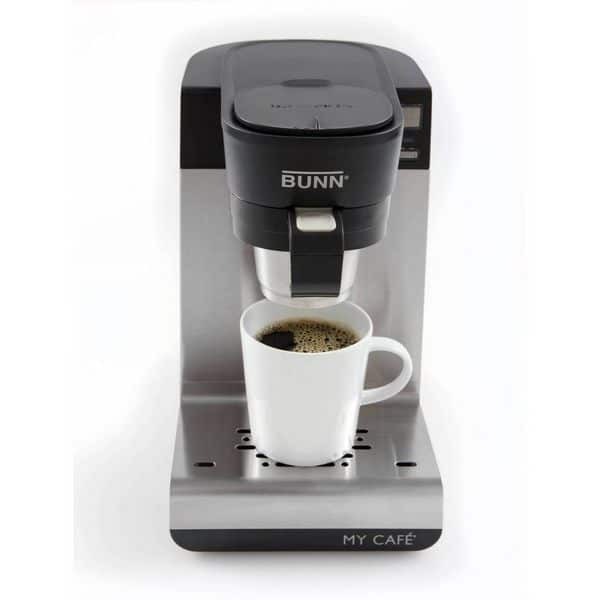 Yes I know, the Bunn MCU sounds like the ‘Swiss-Army-Knife’ of coffee makers. However, the first face-to-face encounter with the Bunn MCU may be a disappointment. There are no fancy buttons or a big display that fills up your heart with excitement. The Bunn MCU’s housing is made of black plastic and only the front is finished with a stainless steel plate. And all it has to offer are two buttons, one for brewing, one for pulsing, and a status LED. But in favor of the machine, it feels very sturdy. Since Bunn is usually famous for their commercial products I guess it’s probably too much to ask for their designers to completely revamp their product line. As long as it does its job and serves a good cup of Joe, I guess we can live with it. 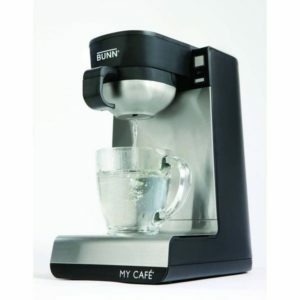 K-Cups, Pods, Ground Coffee and Hot Water for ultimate flexibility with the Bunn MCU! And with the Bunn MCU you can literally say: The inner values are really what counts! 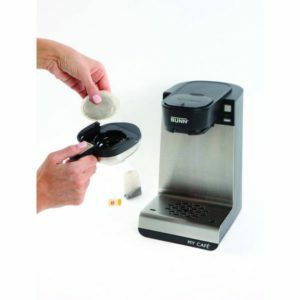 Included in the package are a coffee scoop and four interchangeable drawers, each with its own function. With them you can brew whatever your heart or better your taste buds desire: one is for K-Cups, one for coffee pods and tea bags, one for coffee or even tea grounds and the last one is for hot water. I honestly don’t know any other coffee maker that can provide you with this variety. There is not a lot to say because the Bunn MCU only has two buttons, the brew, and the pulse button. While there is one LED light right below the Brew button that shows either red (heating or problem) or green (ready), the pulse button is surrounded by a red LED light that indicates whether it is on or off (more to the pulse function in the next chapter: Coffee Making Process). The water tank must be refilled for every new cup so the strength of your coffee or tea depends on how much water you fill in the reservoir. There is no indication that shows me the fill level of the water, though. At first you fill up the water tank with fresh water. Bunn recommends 6 ounces of water per K-Cup, for example. But again you are your own boss. The more you pour in, the weaker the coffee gets. There is a max level indicator below the spin lid to show you when you have to stop pouring more water in. Now you have to wait because the machine heats up the water to 200F. Here I have to criticize the first time. In my opinion, it takes too long for the first cup. Even for as little as 6 ounces the Bunn MCU needs over 2 minutes to be ready. When the light then finally turns green you press the Brew button and the pump starts to push the water through the drawer. To the machines defense: after the first long wait time the second cup can be brewed in the twinkling of an eye. The coffee is consistently hot with a full flavor and no bitterness at all. That is a good sign of timing because if water and coffee grounds are in contact too long it creates a bitter stale taste. You should definitely try out freshly ground beans with the corresponding drawer and select the pulse button. All I can say is deeeeelicious! Quick and easy: you can use whatever you want. K-Cups, coffee pods, ground coffee, freshly ground beans, tea bags or pods. You can even pour cocoa mix or oatmeal in your cup and fill it up by using the hot water drawer. The Bunn MCU heats the water to 200°F which is a perfect brewing temperature according to the NCAUSA. The result is a very hot cup of coffee and I highly recommend waiting a minute or two until it has cooled down if you don’t want to burn your tongue. For the strength of the coffee, you have total control over it. The best is to start with the recommended 6 ounces of water and then increase the amount if it’s too strong. After 6 hours idle time, the Bunn MCU lowers the temperature of the water to 140°F. After 26 hours of being idle, the machine will automatically activate the sleep mode. 26 hours is way too long in my opinion. Even when I only brew one cup of coffee every morning at 7 am, the coffee maker never goes to the sleep mode and constantly keeps the temperature at 140 degrees. Not sure how much energy goes down the drain. According to leading testing laboratories, the Bunn MCU heats water to a perfect brew temperature of 200°F. A simple on/off button would be appropriate. Instead, I just unplug the cord when I don’t plan to use it anymore for the day. When a button is pushed or a drawer is removed or inserted, the brewer automatically exits the sleep mode and begins to heat up the water again. Which is very convenient! Every machine needs some pampering, so does the Bunn MCU. The machine has an internal water reservoir that must be filled with water before you use it the first time. When it’s filled up run 2-3 rinse cycles. The drawers are top-rack dishwasher safe but should be rinsed after each use. Every other day you should remove the Drip Tray Cover and clean the Drip Tray with mild dish soap. 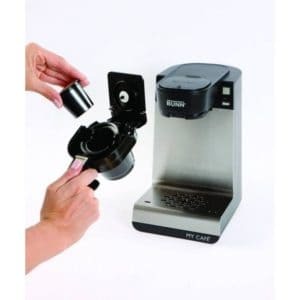 Bunn recommends deep cleaning your coffee brewer every 3 months to remove all accumulated mineral deposits in the machine. If you have a water softener installed the cleaning frequency may be extended. But it’s really easy anyways. All you have to do is filling up the tank with white vinegar, insert any drawer and run a cycle. To get rid of all the vinegar leftover taste, run a few additional water cycles. The spray head can also be removed and cleaned if necessary. When clogged with mineral deposits or coffee or tea grounds it can slow down the brew cycle or start leaking. The first days with the Bunn MCU can be a little irritating. But as soon as you got the hang of it, you will love this machine. Brewing time is fast, it’s simple to use and it provides a rock solid performance. With the flexibility of not being forced to only use K-Cups, it could become your Swiss Army Knife of Single-Cup Brewers. Tell me, do you own a Bunn My Cafe MCU? How do you like it? Please share your experiences in the comments below! Thank you so much for compiling this list – I will not eat or drink from anything made in China (if I can help it) so this was great. Now, if only they’d come up with a coffee maker with no plastic parts and I’d be happy! Going with the chemex – no plastic and no China. Thank you again! Thank you so much for your kind words, Sue! Enjoyed your article and have read many, many others on this coffeemaker. I have one, love it, think it’s the best single-cup coffeemaker available, but my gripe is that both Bunn and most reviewers seem to think cleaning it so so darn simple. I’ve watched countless videos where all they do is with a simple flick of the wrist twist that sprayhead off. That’s wonderful for a brand new coffemaker which hasn’t been used yet, but could just one person out there please tell me how to get that sprayhead off after it’s been used for a year ?????? I’ve tried pliers, using dry rags, tapping with a hammer and chisel lightly…..My sprayhead will not budge. Any advice would be much appreciated. I hear what you saying and I know the pain with the spray head. I broke off some fingernails by trying to rotate it. Don’t really have advice but assuming it may be stuck to old coffee residues, maybe you could try to just immerse the whole top part into a mixture of water and vinegar (or pure vinegar) or water and citric acid. Another “last option” if that doesn’t work: ammonia. I clean my barbecue with it and it’s awesome. You do not need to pure ammonia on the coffee maker. All you need to do is place a cup of ammonia in a plastic bag or sealable container that is big enough for the coffee maker. Then put the plastic bag in a warm place so the ammonia gas can loosen up the stuck coffee residues. As I said I use it for my barbecue and it works wonder! But do that outside, the ammonia gas has a very sharp odor and without proper air ventilation it might be harmful (i’m not a doctor so i can’t guarantee that it’s 100% healthy – please do your own research in regard to ammonia! ).